Our Organic Gardenia Essential Oil (Gardenia jasminoides) is most rare, coming from a small organic grower/extractor in South America who extracts the essential oil by the ancient method of enfleurage. Each of our smaller sizes is nicely presented in a gift box. Due to the limited supply, Enfleurage oils are not available for returns. So, feel free to order a sample vial first. 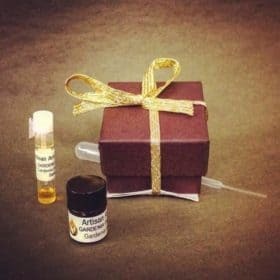 Essential Oil Samples. Also known as Organic Gardenia Essential Oil and Gardenia Absolute. Our Organic Gardenia Enfleurage Oil is part of our Artisan Quality line of essential oils. 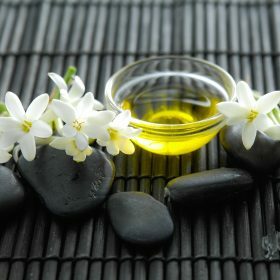 Our Organic Gardenia Enfleurage Oil (Gardenia jasminoides) is pure undiluted Gardenia Oil extracted by Enfleurage. Enfleurage is an ancient technique of extracting essential oils from flower petals by layering the flower petals on trays of fat. Over time, the essential oils migrate to the fat and then essential oils are separated using organic alcohol. Then the essential oils are slowly separated from the alcohol resulting in pure essential oils with a truly wonderful aroma. Our modern version of enfleurage uses sustainably cultivated organic palm oil or organic coconut oil for the “fat”. Gardenia flowers are too delicate for steam distillation. FYI – Some refer to this gardenia oil extracted by the enfleurage method as Organic Gardenia Essential Oil but, the proper term is Organic Gardenia Enfleurage Oil. Our Organic Gardenia Essential Oil – Enfleurage (Gardenia jasminoides) is pure undiluted Gardenia Oil extracted by Enfleurage. Most Gardenia Oil is extracted by harsh chemical solvents and is therefore called an “absolute” (Gardenia Absolute). Although our Gardenia Oil is sometimes called an absolute because it is not extracted by steam distillation, it is technically correct to call it Gardenia Enfleurage. It is most rare, coming from a small grower/extractor in South America who extracts the essential oil by the ancient method of enfleurage using only local organic farm raised palm oil and organic alcohol derived from local organic sugar cane. The entire process of extracting the organic Gardenia essential oil it done by hand using very low heat and no harsh chemical solvents. Pure local organic palm oil is used to absorb the aromatic oils from the gardenia flower petals. Once the palm oil is completely saturated with the essence of the gardenia flower, the locally grown palm oil is separated from the Gardenia oil by cane sugar alcohol which is then evaporated to leave only the Gardenia oil. The process for producing the Gardenia Absolute by Enfleurage is quite labor intensive and requires many pounds of gardenia flower petals per ml of oil, but the results are astounding. The aroma of our Gardenia Enfleurage is quite wonderful though somewhat different from the aroma of the actual gardenia flower. Definitely not as sweet as southern gardenia. Gardenia Essential Oil – Enfleurage (Organic) cannot be distilled like most essential oils due to the delicate nature of the flowers. Enfleurage was the traditional method of extraction used in the 18th and 19th centuries and into the early 20th century. Solvent extraction using hexane has virtually replaced enfleurage except for our own Gardenia Absolute. Solvent extracted Gardenia Essential Oil, called an “absolute”, is used extensively by the perfume industry. But, again, not by us. No chemicals other than organic alcohol are used to extract the Gardenia Essential Oil – Enfleurage (Organic) which we sell. Either method (enfleurage or solvent extraction) is time consuming, and the oil yields are quite small for the amount of materials used. Most noses love the aroma of our enfleurage oils, but a few (less than 1%) of our customers smell more of the palm oil than the essential oil. Initially, in addition to the aroma of the enfleurage oil, one smells the aroma of palm oil a bit “earthy”. 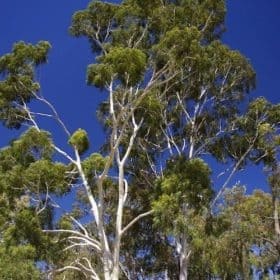 But, if given a few moments to “breathe”, the floral aroma of the oil supersedes or replaces the aroma of the palm oil. This has to do with differences in receptors in the nose. Since our enfleurage products cannot be returned for a refund, due to their rarity,we recommend that you first purchase a small sample vial to insure that you are not among the 1% of people who dislike the earthy note of the palm oil. For those who would like the aroma of our gardenia but without the earthy aroma of palm oil, an alternative is our Limited Edition Organic Gardenia Enfleurage which is extracted with organic coconut oil instead. Gardenia jasminoides was first introduced to the Western world from Cape Colony in Africa. 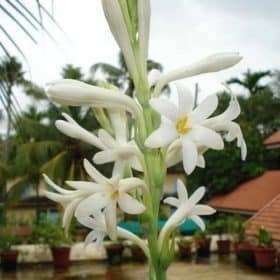 Its name comes from the fact that the aroma of its large white flowers was said to be very much like the scent of jasmine. Now, the most commonly found Gardenia used by the perfume industry is entirely synthetic and has no healing properties whatsoever. Natural gardenia perfume is often enjoyed as a single-flower oil since the rich, warm, heady floral aroma produced from the flowers is considered osmically balanced (like Carnation and Lavender). 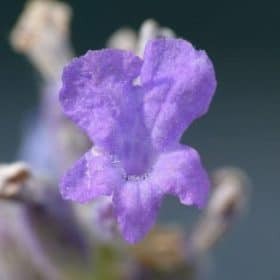 This means their floral compounds are perfectly balanced, containing a top, middle, and base note. 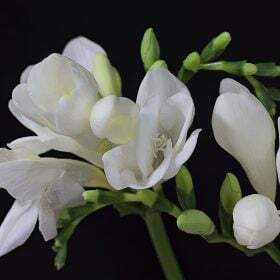 The Gardenia jasminoides species is the most common of these fragile plants and material from dried Gardenia flower petals is commonly used in Chinese herbal medicine. Its Chinese name is zhi zi. The traditional medicinal actions attributed to Gardenia include calming irritability, cooling blood, and clearing away heat (a yin/yang imbalance often characterized by deficient yin) reducing swelling, and moving stagnant blood that has congealed in one place, usually following trauma. Gardenia Essential Oil is considered to be very effective as a hemostatic agent, which means that it stops bleeding. It also is effective in treating injuries to the muscles, joints, and tendons. Gardenia Essential Oil is commonly used in Chinese herbal formulas to treat infections, particularly bladder infections, abscesses, jaundice, and blood in the urine, sputum, or stool. 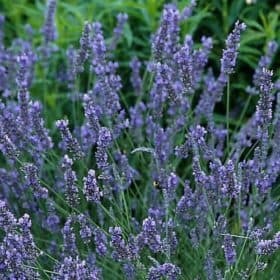 Because of its perceived ability to ease agitation or irritability, it is also used in formulas to treat anxiety or insomnia. Gardenia Essential Oil is also helpful in correcting menopausal imbalances reflected in insomnia and depression, nervous tension, headache, and dizziness. The United States Department of Agriculture Research Service phytochemical and ethnobotanical database lists Gardenia jasminoides as having specific medicinal properties. 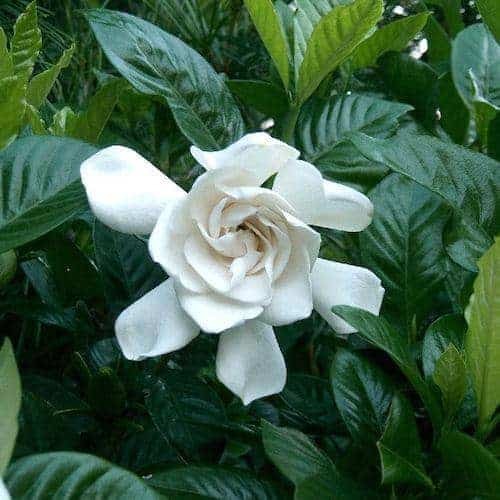 Gardenia has been found to be helpful in the treatment of pain, nose bleeds, fever, and influenza, in healing wounds and reducing swelling, and in treating mastitis, hepatitis and the hematuria that accompanies bladder infection. Wonderfully heady!! This with the Tuberose enfleurage smell so great together. Both have a rich and full methyl anthranilate content. The true essence of grape! A little Jasmine can make a very nice night flower room spray too! Very versatile. I have grown gardenias as house plants, and this is the real thing. The fragrance is heady and pure. It is very well worth the price, even if you have to save up for it. Simply an amazing, pure Gardenia smell! All the essence of the flower, pure, with no traces of other scents thanks to extraction method.